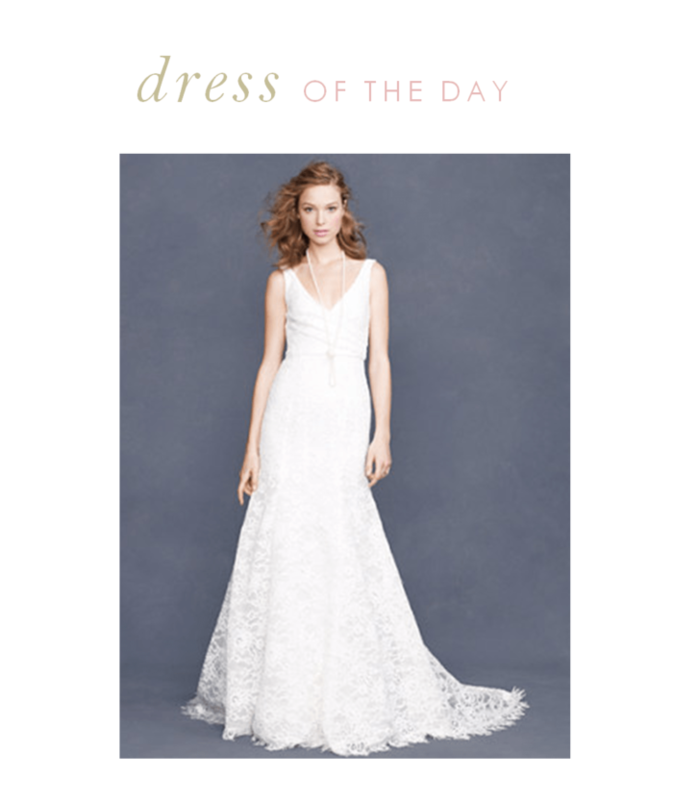 I have decided to start a new tradition here on Dress For The Wedding since engagement and wedding season is fully upon us, and I’m calling it the dress of the day, which for this month at least will be bridal gowns. I feel like I only have a few posts dedicated to bridal gowns, and the reason for that is simple; I sometimes feel a lot of pressure at the idea of putting the exact right accessories with a wedding dress, since I know a bridal gown and the accessories can be is so personal, and the theme of the wedding is usually so unique. Plus if you have family heirlooms and other jewelry – you’ll probably plan on wearing that. So, I’ll endeavor to show you the bridal dresses I find to be lovely every day for as long as I can keep this up:) Many will be available online, but some will be from independent designers and only available in bridal boutiques. Today’s lovely dress is the Sara, from J.Crew. I love the long train and lace, and it’s very fitting since I just worked with Sara from Burnett’s Boards, and she’s a lovely person!